4 ply worsted weight yarn Red Heart (Colors respectively: Aran Fleck, Windsor Blue): 5-6 oz. Fpdc (front-post double crochet): Yo once, insert hook front to back around post of next st and pull up loop, [yo, draw through 2 loops on hook] twice. Fptr (front-post treble): Working in front of work, yo twice, insert hook from front to back to front around post of st indicated and pull up loop, [yo, draw through 2 loops on hook] 3 times. 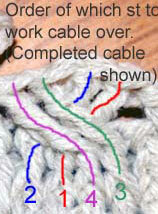 Bpdc (back-post double crochet): Yo once, insert hook back to front to back around post of st indicated and pull up loop, [yo, draw through 2 loops on hook] twice. Cable: (Works using posts of next 4 stitches): Skip 2 stitches, [fptr around post of next stitch] twice, fptr around post of first skipped stitch (the skipped stitch on the right), fptr around post of next skipped stitch. Rsc: (Works to the right): Insert hook in st to the right of the st just worked and pull up a loop, yo and draw through 2 loops on hook. Ch 3, join with sl st to first ch to make ring. Rnd 1: Ch 3 (counts as first dc now and throughout), work 14 dc in center of ring, join to top of ch 3 DO NOT TURN. dc..
Rnd 2: Ch 3, dc in same st, work 2 dc in each st around; join with sl st to top of ch-3. dc..
Rnd 3: Ch 3, dc same st, [dc in next st, 2 dc in next st] 4 times, 2 dc in next st, [2 dc in next st, dc in next st] 4 times, 2 dc in each of next 3 st, [dc in next st, 2 dc in next st] 4 times, 2 dc in last st; join with sl st to top of ch-3. dc. Rnd 4: (See FIG Below) Ch 3, dc in each next 3 st, work Cable (see Stitches) using posts of next 4 dc, [dc in next 4 st, work cable using posts of next 4 dc] 5 times; join with sl st to top of ch-3. [6 cables and 24 dc] =  sts total. Rnd 5: Ch 3, dc in same st (Note: This is the same st joined in at end of last rnd), dc in next st, 2 dc in each of next 2 dc, fpdc (see Stitches) around post of each of next 4 fptr of Cable, *2 dc in next st, dc in next st, 2 dc in each of next 2 dc, fpdc around post of each of next 4 fptr of Cable. Rep from * around; join with sl st to top of ch-3. [24 fpdc, 42 dc] =  sts total. Note: When "cable" st is called in Rnd 6, you will work cable using posts of next 4 st indicated; working the cable st exactly as you did in Rnd 4- see FIG above for reference..
Rnd 6: Ch 2 (Counts as first st, now and throughout), fpdc around post of next st, bpdc(see Stitches) around post of next dc, (fpdc, bpdc, fpdc) all around post of next st, bpdc around post of next st, fpdc around post of next st, bpdc around post of next st, work cable using posts of next 4 sts, *bpdc around post of next st, fpdc around post of next st, bpdc around post of next st, (fpdc, bpdc, fpdc) around post of next st, bpdc around post of next st, fpdc around post of next st, bpdc around post of next st, work cable using posts of next 4 st. Repeat from * around; join with sl st to top of ch-2. Do not fasten off. [9 sts in between each cable]  sts total. Rnd 7: Ch 2, [fpdc around post of next st, bpdc around post of next st] 4 times, fpdc around each 4 post sts of next Cable, *bpdc around post of next st, [fpdc around post of next st, bpdc around post of next st] 4 times, fpdc around each 4 post sts of next Cable. Rep from *around; join with sl st to top of ch-2. sts. Rnd 8: Ch 2, [fpdc around post of next st, bpdc around post of next st] 4 times, work cable using posts of next 4 sts, *bpdc around post of next st, [fpdc around post of next st, bpdc around post of next st] 4 times, work cable using posts of next 4 sts, repeat * around; join with sl st to top of ch-2. Rnd 9: Ch 2, [fpdc around post of next st, bpdc around post of next st] 4 times, fpdc around each 4 post sts of next Cable, * bpdc in next st, [fpdc in next st, bpdc in next st] 4 times, fpdc around each 4 post sts of next Cable. Rep from * around; join with sl st to top of ch-2. Rnd 10-23: Rep Rnds 8 and 9. Customization: Rep Rnds 8 and 9 for length desired ending on either rnd. Do Not fasten off. Body completed. Rnd 24: Ch 2, [fpdc around post of next stitch, bpdc around post of next stitch] 4 times, *[fpdc around post of next st] 4 times, bpdc around post of next stitch, [fpdc around post of next stitch, bpdc around post of next stitch] 4 times. Repeat from * around; join with sl st to top of ch-2. Rnd 25-29: Rep Rnd 24. 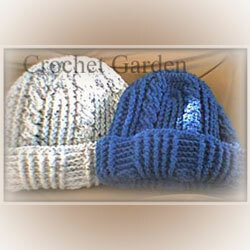 Customization: Make brim longer of shorter by adjusting the number of times repeating Rnd 24. Rnd 30: Ch 1, turn; sc in same st, working to the right, (insert hook in st to the right of the st just worked and pull up a loop, yo and draw through 2 loops on hook) (rsc completed), rsc in each st around; join with sl st to first sc, fasten off.